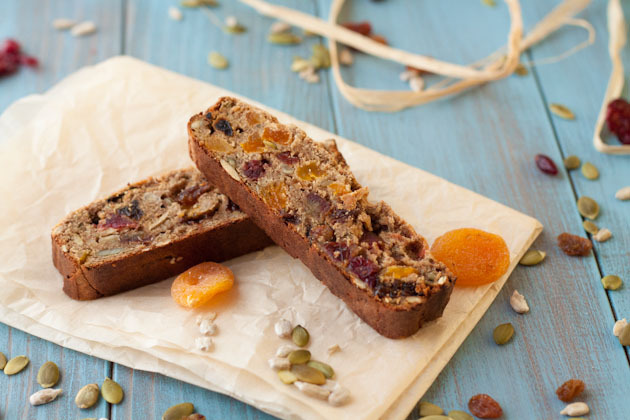 A vegan and gluten-free snack bread loaded with dried fruit and seeds! Each slice has over 5 grams of fiber and packs great for school, the gym, or a trip around the world. Preheat oven to 375F and line an 8 x 4-inch loaf pan with parchment paper across both sides for easy lifting. Combine dry ingredients in a medium sized bowl. Add wet. The consistency should be similar to a muffin. 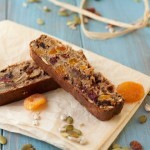 Add dried fruit and seeds. Bake for 35-40 minutes until sides begin to brown and the top will be cracked and toothpick inserted comes out clean. Remove from the oven, lift from the pan and place on a cooling rack for 20 minutes before cutting with a sharp knife.